I am setting up a new blog where I will serialise some of my stories. 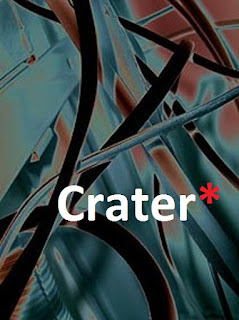 The first will be Crater, a sci-fi novel. You can find the blog here or just follow the link in my blog list. All chapters are now uploaded and so just click on the newer post link at the bottom of each chapter or use the side bar chapter index to read the whole novel. After one of the wettest years on record, when most of the country seemed to be under inches of water, to say that gardening was somewhat trying in 2012 is an understatement. Fields of ruined crops, allotments in constant rain and waterlogged and cold gardens formed a miserable backdrop to a year when I started to question again what it was I was looking for from the garden and what role the garden plays in our life. Up to now it had been my haven, a safe place for the kids to play, a place to entertain, a space to welcome in the wildlife from the neighbouring woodland, a pesticide free, fun, untidy extra room for us to spill into on those long summer days... only last year that didn't happen. I can probably count on one hand the number of meals eaten outside last year. It was a year of unkempt flowerbeds, mould, mildew, mushrooms and a climate of cold, damp indifference. The things that flourished were weeds and slugs and snails, even a frog took up residence in the grass, it was that wet. Normally, leaving the garden pretty much unattended for a year spells disaster, a tide of dandelions and bindweed rising up to replace hard won borders. But last year everything seemed to struggle and it is this fact that started me thinking about what happens when our gardens fail due to extreme weather conditions and what the long term future for our outdoor spaces will be if we continue with a trend of wet, cold, sunlight deprived summers? For a while now the garden has needed a rethink. The kids are reaching their teens and no longer want to tear around in it and I cannot ignore the fact that I am no longer quite so willing to slog at the endless round of weeding and pruning that the garden requires in its current format. It is more than a little tempting to let it return to woodland, to let nature crowd out the ornamentals and leave the trees seeded by jays to grow, to let the oaks take hold and return the plot back to the wildwood that once covered this country. Climate change, whether human made or not, is something everyone has an opinion on and no one seems to agree on. I can only go on what we are living through, a period of intense weather extremes. One year drought, the next deluge. And I wonder if the notion that if I left our garden to return to nature it would eventually revert to woodland is an outdated concept. Could woodland flourish again in these extremes? As more of our native trees come under threat to disease and climate distress, is that ancient woodland we see as so much part of our history, irrevocably gone from the landscape? And what replaces it instead? Much has been made in recent years of mediterranean planting but the seesaw nature of drought and deluge doesn't suit these plants either. Can we call this a temperate climate with these extremes and, if we are facing years of wetter weather, will our landscape slowly evolve into low lying swamps and barren tundra-like hillsides? And what food to grow? The conclusion I am coming to is that a greenhouse may be the only way to raise reliable home-grown crops if these weather patterns continue. Food at what ecological and financial cost is going to be an ongoing concern this year. Unsustainability in price, effort and yield soon turns a hobby into a chore. Some plans remain intact for the garden this year, a pond for wildlife seems a good choice. Updating the patio with less slippery paving and better drainage seems sensible. Beyond that, how the garden evolves is probably out of my hands and firmly in the grip of the ever changing weather.